I love watching the Olympics. Slap an American flag on your uniform, and I don't care what sport you're playing, I'll root for you to beat that other guy or gal wearing a different flag. The Olympics are the only reason most of us ever care about gymnastics, swimming, or curling, but we fall in love with those events and the electricity of the games. Therefore, it makes it so much more fun to root for someone not only competing for your country, but also representing your school. As most Purdue sports fans know, Olympic diver David Boudia brought home a bronze medal yesterday in the 10m platform synchronized diving event. After placing fifth at the 2008 Beijing games at the age of 19, Boudia has grown into a very accomplished diver and surely benefited from calmer nerves as a veteran competitor. Boudia's medal is the first for a Purdue graduate competing in the Olympics in a long time. Back in the 2000 games, Chris Huffins earned a bronze in the decathlon, but Huffins never graduated from Purdue, only competing two years in the Big Ten before transferring to California. To find the last graduate to win a medal, you have to go back to Naismith Hall-of -Famer Terry Dischinger who played as a collegiate athlete on the 1960 men's basketball team. That team featured future greats Jerry West, Oscar Robertson, Jerry Lucas, and Walt Bellamy and won a gold medal. Prior to the 1992 Dream Team they were regarded as the best US Olympic basketball team ever. To find the last Purdue graduate to medal in an individual event at the Olympics, you have to go all the way back to Keith Carter in 1948. Carter won silver in the 200m breaststroke, also coincidentally at games held in London. That's 64 years and 15 Olympic competitions between individual medalists. Big thanks to David for bringing some pride back to Boilermaker country. Congratulations to David, and we'll be rooting hard on August 10th and 11th as he competes in the 10m platform individual event. I'll be the first to admit, this series has gotten a little dull. We're down to the bottom of the barrel for the "worst team ever" edition of Where Are They Now, but that's no excuse. Especially when the guy I get to profile is a Mackey Arena legend. I've never seen a walk-on get so much love, ignite a crowd with one shot, and actually play important minutes as much as this guy. That's right, part nine of this series features Bobby "Buckets" Riddell. I'm sure you all know the Buckets story already. Bobby came to Purdue as a walk-on townie, having had a great high school career at Harrison High in West Lafayette. At 5'9" little (pun intended) was expected of him, but fans love a townie who bleeds Gold and Black. The 2005-2006 season was Bobby's freshman year, and thanks to all the injuries, attitude problems, and inconsistency on the team, he actually saw some playing time in 20 games. Although he only averaged 6 minutes per game, he made 46% of his three point attempts (pretty much the only shots he took), and showed fans that he could at least shoot better than your average walk-on. There wasn't much to root for that season, so it made it even more special to see Bobby amaze and astonish the crowd. On a personal note, back then my wife worked for Bobby's dad, a local cardiologist, and he'd light up talking about the games and his son's role on the team. Talk about a proud papa who was faithfully there at every game. The next two seasons, with a healthy more talented team and influx of Baby Boilers, Buckets saw his minutes decrease as he only really saw action in garbage time. I'm sure that had to be difficult, but he persevered and continued to work hard in practice to impress the coaches and make the most out of his opportunity. In his senior season, Bobby saw his minutes increase again as he got more playing time in 27 games. While some of those minutes were in garbage time, others were at critical junctures. He shot an amazing 64% that season, sending the Paint Crew into hysterics with every shot. The highlight of his season had to be his 13 point, 4 assist performance against Penn State on 5 of 7 shooting. He played more minutes than some of the starters that night and was nearly the team's leading scorer (JJ had 14) in a game the Boilers led by only two points at halftime (after losing by two to Penn State on the road earlier that year). Enough reminiscing. What happened to Bobby after his senior season? As many of you know, Bobby stuck around and served as the graduate assistant during the 2009-2010 season. After that, he used his Krannert accounting degree to land a job as an auditor at Dauby O'Connor & Zaleski in Carmel, IN. You can catch up with Bobby on Twitter or LinkedIn, or you can simply attend the alumni game and scrimmage on August 4th at Mackey. I'll be there, and I'm sure at some point I'll start a Bob-by-Buck-ets chant. As we hit the baseball all-star break, sports fans are looking for anything to distract them from the only 3 days of the year without a meaningful sport event. Well, 2 days if you're in the "This Time It Counts" crew. So let's get through this miserable sport-less period together by looking at next year's Purdue Men's Basketball Nonconference Schedule! Wait, where is it? ESPN doesn't have it. Gold and Black doesn't have it. Purduesports.com must have it, right? I mean, last year they announced the schedule on MAY 19TH!!! Nope. That's right, it's nearly 2 months later than last year's announcement, yet Purdue has still not officially released their schedule. Instead, we can put together bits and pieces to figure out the bulk of the schedule. 1) 2 of Villanova, Oregon State, and Alabama at Madison Square Garden in the 2K Sports Classic on November 15th and 16th. 2) At Clemson in the ACC/Big Ten Challenge on November 28th. 3) In Indianapolis on December 15th against Notre Dame in the Crossroads Classic. Xavier also owes Purdue a return trip to Mackey, but that date hasn't been announced yet. No other games (to my knowledge) have been announced. Could there be one more big schedule announcement that Purdue is waiting on before announcing the obligatory "filler" games? Why would they wait this long to release the schedule when they released it in May last year? 1) Purdue nearly did it last year and they will announce this year that they've FINALLY pulled off the trifecta - games against ALL 3 directional Michigan schools! 2) Purdue takes IU's spot and starts an Indianapolis/Louisville neutral site series against Kentucky. In looking at the games we do know about, it still seems like a pretty strong schedule for a team that has hopes of being a bubble team. And this year's Italy trip will be even more important since the 2K Sports Classic will be right out of the gate. In other scheduling news, the Big Ten has again decided to screw Big Ten fans by having nearly all their bowls at the exact same time. That's right, just like last year, 4 bowls will kickoff between noon and 1:00 on New Years Day and all of them will involve a Big Ten team. My favorite thing about bowl season is watching and rooting for the Big Ten to kick the snot out of the power conferences (SEC/Big 12/MAC), yet this schedule once again lumps most of the games into one time slot. Oh, and let's not even mention the 2 other Big Ten bowl games that start at 9:00 and 10:15 pm. Maybe I want to go back to the Little Caesars Bowl after all. So far, our Where Are They Now series has put the spotlight on the seven highest scorers from the 2005-06 Purdue Men's Basketball team. Of those seven, Chris Lutz is the only one to have played for Purdue after that ugly season (and even he transferred the following year). The eighth highest scorer, however, was a Purdue player that nearly everyone remembers. In fact, I'd argue that with the new fans the team has gained over the past couple of years, this player may be the most well-known of the top 8 to today's Purdue fan. Part 8 of the Where Are They Now series looks back at (and checks in with) the career of Marcus Green. Marcus Green graduated from East Leyden High School near Chicago and was generally regarded as the "afterthought" member of the freshman class. However, Green actually turned down offers to Dayton and Marquette to come to Purdue, which goes to show how highly regarded this freshman class actually was. Minnoy, Spates, and Lutz were considered the potential stars, yet it was Green who made the biggest impact on the court during his time in West Lafayette (although one could argue that Minnoy made a huge impact on the court every time he landed). Green's career at Purdue was plagued by inconsistent shooting, but he came up with a couple of unforgettable All-American-esque performances. His freshman year provided a glimpse at this as he absolutely went off in a home game against #22 Michigan. Marcus only scored double digits 3 times and averaged 5.5 points per game that year, yet he went off for 23 points on 9 of 13 shooting in Purdue's biggest upset (and blowout) of the year. Make sure to check out the highlights on youtube (bonus: check out yours truly at 2:52 in the video - I look like I'm moving around pretty good considering I tore several ligaments in my foot at the Purdue-Minnesota game the prior month...I'll get into that story some other time). Marcus started 13 games as a freshman, yet his minutes actually regressed each year and he never averaged more than five points per game again. In fact, he only started 8 games after his freshman year. However, his junior year included another remarkable performance as Marcus scored 22 points in 23 minutes in a huge win at Mackey against Ohio State. "It caught me off guard and it caught my mom off guard," Green said. "I thought, 'Is it St. Patrick's Day or something?' Then I looked more and more at the T-shirts and thought, 'Oh, man, that's me.'" In doing this series, I've started to realize that the vast majority of college basketball fans (including myself) have no clue about professional basketball outside the United States. Every year around the time of the NBA Draft, discussion about players who just miss getting drafted center around "are they good enough to play overseas?" In reality, this series is showing that just about every Division 1 college basketball player that contributes is good enough to play overseas. Marcus Green is no different. "his team was a role player with defensive characteristics, which came to do their specific job. As we do not need a player with leadership and suited economic possibilities, we decided to add it, thinking that we can help. comes from a prestigious university"
Not the highest praise for Green, but it still gave Marcus a chance to show he could make it in professional basketball. Green was given a one month contract and had a patented "Marcus Green Breakout Performance", leading the team with a 20 point effort in a win over Quilmes Mar Del Plata. However, even with the breakout performance, Green was cut just 4 days later in favor of Brian Woodward of Rhode Island. Unfortunately, that appears to be the end of Marcus Green's professional basketball career. More recently, Marcus has been living in the Chicago area and working in all sorts of basketball-related roles. He has been working basketball camps for all ages and is currently on the staff of Finish Strong Athletics, a K-8 basketball prep program. On the FSA website, it also mentions he's a director of Elite Sports Performance's basketball program (although there's no mention of him on their own website). In a confirmed sighting, Green has been helping coach AAU teams as he was spotted as an assistant coach at the D-I Elite Tournament in Elmhurst, IL last summer. Marcus is scheduled to make an appearance at the alumni game in August, but if you can't wait until then to get his attention, make sure to friend him on Facebook! I'm still waiting for a response, but I'm sure it's because he still remembers how I voiced my displeasure every time he missed a wide-open three from the corner. That doesn't mean he won't accept YOUR request! 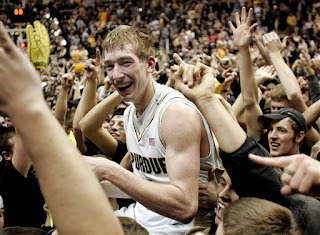 As always, stay tuned to GoBoilers.net as we continue our summerlong 2005-06 Men's Basketball Where Are They Now series! Thanks to Rant Sports, I found the perfect way to end a Monday at work: watching DJ, Dru, and Ryne make some crazy shots at Mackey. Now we know who should take that last second shot backwards, between his legs, from half court. Glad we got that figured out. 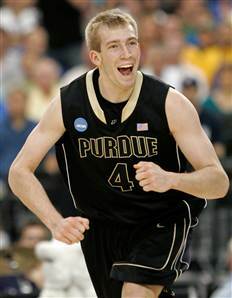 Although it was a long wait, definitely one full year too long, let alone 58 picks, Robbie Hummel made it to the NBA on Thursday night. The Minnesota Timberwolves, an often floundering franchise, has been righting its ship lately and made a smart decision many other teams failed to make. 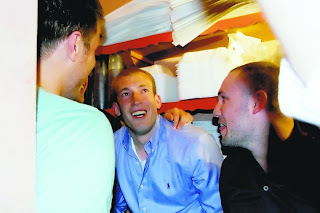 We couldn't be more excited for Robbie, who waited out the evening with friends, family, and teammates at Bruno's near Purdue's campus (I think our invite got lost in the mail). The three Baby Boilers are now all grown up, and as we expected after their amazing freshman seasons, all three were drafted into the NBA. If only the Celtics could have picked Robbie too, am I right?! I waited to post about Robbie heading back to Minnesota because you never know what trades may happen immediately following the draft, but it looks like for now the T-wolves will be employing his services (although they're trying to acquire Pau Gasol from the Lakers, so you never know if Robbie will get thrown in a deal and head west). He gets to return to the land of unspeakable injuries and will hopefully break the curse with a long and successful NBA career. We know he has the skills, the brains, and the drive, so hopefully the body holds up. We've seen that with those traits a Boilermaker can make quite a career in the NBA. So what's in store for Robbie in Minnesota? Many NBA experts think Minnesota, after years of futility and confusing management, has the chance to turn the corner next year and even contend for the playoffs. The team hasn't won more than 40% of its games since 2006, but prior to some key injuries last season, the Timberwolves had a winning record. The roster next season boasts All-NBA second team stud Kevin Love, who is a 26 ppg/13 rpg monster, and Spaniard point guard Ricky Rubio, who is currently recovering from knee surgery after tearing his ACL in March. At least that gives Robbie and him something to talk about. Last year's top draft choice, Derrick Williams, has potential but is still learning with a below average PER. He could see more playing time alongside Love or be relegated to backing him up. The team has a serviceable center (and the infamous Darko if they don't amnesty him), but is worthless at the shooting guard spot. Previous top five draft choice Wesley Johnson looks to be a bust, and the rest of the team is composed of various mediocre (or worse) role players. One bright spot - the team is well under the salary cap, which leaves them the chance to acquire another star, like Gasol, although they could certainly use some better shooters. They're pursuing Jamal Crawford and the recently-returned-from-retirement Brandon Roy, but I think it's a long shot they get either player. Hopefully that gives Robbie the perfect opportunity to make a name for himself, although he'll have to pass Chase Budinger on the depth chart, who plays a very similar style game. Maybe if he does ESPN can learn to spell his name correctly. Congratulations Robbie! Cuz you're growns up and you're growns up and you're growns up! I look forward to watching the Timberwolves, something very few people in the world would dare utter.